For other people named Michael Powell, see Michael Powell (disambiguation). Michael Latham Powell (30 September 1905 – 19 February 1990) was an English film director, celebrated for his partnership with Emeric Pressburger. Through their production company "The Archers", they together wrote, produced and directed a series of classic British films, notably 49th Parallel (1941), The Life and Death of Colonel Blimp (1943), A Matter of Life and Death (1946, also called Stairway to Heaven), Black Narcissus (1947), The Red Shoes (1948), and The Tales of Hoffmann (1951). His later controversial 1960 film Peeping Tom, while today considered a classic, was so vilified on first release that his career was seriously damaged. Many film-makers such as Martin Scorsese, Francis Ford Coppola and George A. Romero have cited Powell as an influence. In 1981, he received the BAFTA Academy Fellowship Award along with his partner Pressburger, the highest honour the British Film Academy can give a filmmaker. Powell was the second son and youngest child of Thomas William Powell, a hop farmer, and Mabel, daughter of Frederick Corbett, of Worcester, England. Powell was born in Bekesbourne, Kent, and educated at The King's School, Canterbury and then at Dulwich College. He started work at the National Provincial Bank in 1922 but quickly realised he was not cut out to be a banker. Powell entered the film industry in 1925 through working with director Rex Ingram working at the Victorine Studios in Nice, France (the contact with Ingram was made through Powell's father, who owned a hotel in Nice). He first started out as a general studio hand, the proverbial "gofer": sweeping the floor, making coffee, fetching and carrying. Soon he progressed to other work such as stills photography, writing titles (for the silent films) and many other jobs including a few acting roles, usually as comic characters. Powell made his film début as a "comic English tourist" in The Magician (1926). After scriptwriting on two productions, Powell entered into a partnership with American producer Jerry Jackson in 1931 to make "quota quickies", Powell began to direct hour-long films needed to satisfy a legal requirement that British cinemas screen a certain quota of British films. During this period, he developed his directing skills, sometimes making up to seven films a year. Although he had taken on some directing responsibilities in other films, Powell had his first screen credit as a director on Two Crowded Hours (1931). This thriller was considered a modest success at the box office despite its limited budget. From 1931 to 1936, Powell was the director of 23 films, including the critically received Red Ensign (1934) and The Phantom Light (1935). In 1937 Powell completed his first truly personal project, The Edge of the World. Powell gathered together a cast and crew who were willing to take part in an expedition to what, before the air service that now exists, was a very isolated part of the UK. They had to stay there for quite a few months and finished up with a film which not only told the story he wanted but also captured the raw natural beauty of the location. By 1939, Powell had been hired as a contract director by Alexander Korda on the strength of The Edge of the World. Korda set him to work on some projects such as Burmese Silver that were subsequently cancelled. Nonetheless, Powell was brought in to save a film that was being made as a vehicle for two of Korda's star players, Conrad Veidt and Valerie Hobson. The film was The Spy in Black, where Powell first met Emeric Pressburger. The original script of The Spy in Black followed the book quite closely, but was too verbose and did not have a good role for either Veidt or Hobson. Korda called a meeting where he introduced a diminutive man, saying, "Well now, I have asked Emeric to read the script, and he has things to say to us." "Emeric produced a very small piece of rolled-up paper, and addressed the meeting. I listened spellbound. Since talkies took over the movies, I had worked with some good writers, but I had never met anything like this. In the silent days, the top [American] screenwriters were technicians rather than dramatists[, but]... the European cinema remained highly literate and each country, conscious of its separate culture and literature, strove to outdo the other[s]. All this was changed by the talkies. America, with its enormous wealth and enthusiasm and it technical resources, waved the big stick. ... The European film no longer existed[,]... [except for]...the great German film business ... and Dr. Goebbels soon put a stop to that in 1933. But the day that Emeric walked out of his flat, leaving the key in the door to save the stormtroopers the trouble of breaking it down, was the worst day's work that the clever doctor ever did for his country's reputation, as he was soon to find out. As I said, I listened spellbound to this small Hungarian wizard, as Emeric unfolded his notes, until they were at least six inches long. He had stood Storer Clouston's plot on its head and completely restructured the film." Working together as co-producers, writers and directors in a partnership they dubbed "The Archers", they made 19 feature films, many of which received critical and commercial success. Their best films are still regarded as classics of 20th century British cinema. The BFI 100 list of "the favourite British films of the 20th century" contains five of Powell's films, four with Pressburger. Although admirers would argue that Powell ought to rank alongside fellow British directors Alfred Hitchcock and David Lean, his career suffered a severe reversal after the release of the controversial psychological thriller film Peeping Tom, made in 1960 as a solo effort. The film was excoriated by mainstream British critics, who were offended by its sexual and violent images; Powell was ostracized by the film industry and found it almost impossible to work thereafter. The film did however meet with the rapturous approval of the young critics of Positif and Midi-Minuit Fantastique in France, and those of Motion in England, and in 1965 he was subject of a major positive revaluation by Raymond Durgnat in the auteurist magazine Movie, later included in Durgnat's influential book A Mirror for England. Powell's films came to have a cult reputation, broadened during the 1970s and early 1980s by a series of retrospectives and rediscoveries, as well as further articles and books. By the time of his death, he and Pressburger were recognised as one of the foremost film partnerships of all time – and cited as a key influence by many noted filmmakers such as Martin Scorsese, Brian De Palma, and Francis Ford Coppola. Subsequently, Powell was married to film editor Thelma Schoonmaker from 19 May 1984 until his own death from cancer at his home in Avening, Gloucestershire. 1959: Cannes Film Festival won the Technical Grand Prize for Luna de Miel. Nominated for Golden Palm. 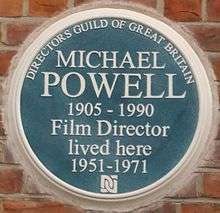 2014: An English Heritage Blue plaque to commemorate Michael Powell and Emeric Pressburger was unveiled on 17 February 2014 by Martin Scorsese and Thelma Schoonmaker at Dorset House, Gloucester Place, London NW1 5AG where The Archers had their offices from 1942 - 47. Cited as a major influence on many film-makers such as Martin Scorsese, Francis Ford Coppola, George A. Romero and Bertrand Tavernier. Said Thelma Schoonmaker (Scorsese's long-time film editor and Powell's third wife) of Scorsese, "Anyone he meets, or the actors he works with, he immediately starts bombarding with Powell and Pressburger movies." Scorsese and Schoonmaker are working on restoring Powell's films, beginning with The Red Shoes and The Life and Death of Colonel Blimp. The Michael Powell Award for the Best New British Feature was instigated in 1993 at the Edinburgh International Film Festival and is sponsored by the UK Film Council and is "named in homage to one of Britain's most original filmmakers". The Film, Radio and Television Department of Canterbury Christ Church University has its main building named after him: The Powell Building. Many of his early films are disparagingly referred to as "quota quickies". Not all of them were really quota films, and the ones that were are often of a much higher standard than most other quota films. Some of his early films are now missing and are believed lost. But those that have survived often show some very sophisticated techniques and early versions of ideas that were reused, done better, in his later films. Those marked with a * are "Missing, believed lost". Red Ensign Gaumont-British US title: Strike! 1975: A Waiting Game. London: Joseph. ISBN 0-7181-1368-3. 1978: (with Emeric Pressburger) The Red Shoes. London: Avon Books. ISBN 0-8044-2687-2. ↑ It was Hitchcock who suggested using Kim Hunter in A Matter of Life and Death. ↑ Forshaw, Barry (20 September 2012). British Crime Film: Subverting the Social Order. Palgrave Macmillan. p. 56. ISBN 978-1-137-18497-9. ↑ Crouse, Richard (26 August 2003). The 100 Best Movies You've Never Seen. ECW Press. p. 167. ISBN 978-1-55490-540-9. 1 2 Crook, Steve. "Famous Fans of Powell & Pressburger." Powell-pressburger.org. Retrieved: 28 September 2009. 1 2 3 Duguid, Mark. "Early Michael Powell." Screenonline. Retrieved: 28 September 2009. ↑ "Features: The BFI 100." BFI, 19 February 2008. Retrieved: 28 September 2009. 1 2 3 4 Robson, Leo (May 9, 2014). "Thelma Schoonmaker: the queen of the cutting room". FT Magazine. Retrieved May 10, 2014. ↑ "1st Berlin International Film Festival: Prize Winners." berlinale.de. Retrieved: 21 December 2009. ↑ Rose, Steve. "Scorsese: my friendship with Michael Powell." guardian.co.uk, 14 May 2009. Retrieved: 1 September 2010. ↑ "Awards History." edfilmfest.org.uk. Retrieved: 28 September 2009. Christie, Ian. Arrows of Desire: The Films of Michael Powell and Emeric Pressburger. London: Waterstone, 1994. ISBN 0-571-16271-1; First edition 1985. ISBN 0-947752-13-7. Powell, Michael. A Life in Movies (autobiography). London: Heinemann, 1993. ISBN 0-571-20431-7; First edition 1986. ISBN 0-434-59945-X. 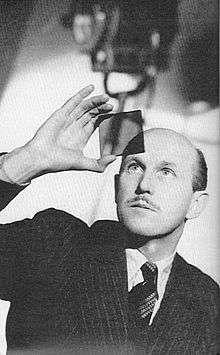 Michael Powell at the Powell & Pressburger Pages.